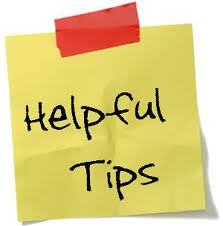 Final tips….add your own to the list! Allow your child to develop their own passions, likes, and dislikes. Provide opportunity for your child to experience many things to discover passions, likes, and dislikes. Your child may not like the same things that you do, and that is OK! Don’t be a gatekeeper, allow Dad or other important people in your child’s life to participate in parenting. Realize that there is benefit in doing things differently, different is not always wrong. Have a united front with Dad; this gives your child a clear message of expectations. Never disagree about parenting issues in front of your child. Parents, who are not on the same page, will be manipulated. Defining your expectations helps your child determine expected behavior. Setting expectations beforehand gives better results. Frequent discussions about what you expect from your child helps him or her develop a good moral compass. Manners and respectful behavior will help your child be successful. Your behavior that your child observes is more important than the words you speak. Make sure that your actions show respect of your child. Provide the example of gratitude. This will defuse a frustrating or angry situation. Everyone will remain calmer if voices are quieter. Your child will have to calm down in order to hear you. Following through on discipline in public will allow you to leave your home!! Children learn very quickly when and where you will not follow through with consequences…and they will behave accordingly. Your child will hear “no” many times, save it for the important things. Pick your battles, some are not important enough to pick! 38. Don’t reward everything. Let your child learn the valuable lesson of being proud of himself . Let your child develop an inner drive to success. Constant rewards and praise result in a child that is externally motivated, driven by the outside things. Internal motivation results in a child who does the right thing because it feels good, not because he will “get something” in the end. Knowing who your child’s friends are gives you a glimpse of their life away from you. Know the parents of your child’s friends; parenting together gives you a sounding board and more parenting power. Your child does not expect or need perfection. Being too hard on yourself, makes you not trust your parenting. Expecting perfection from yourself sets the example for your child that only perfection is acceptable. We only need to be “good enough”…not perfect. Lighten up, there is always room for silliness. Unconditional love trumps parenting imperfections! Being a parent should not doom your life to worry. No child will starve themselves, temper tantrums are part of childhood, embarrassing behavior happens, you can’t protect your child from every illness and injury, and your child can be happy without the latest and best video game or pair of jeans….and many, many more worries that are not worth the energy! Adequate sleep makes everything look better. Children are wired early to bed early to rise. Early bedtimes provide evenings for you to refill, recharge, and reconnect. Documenting your child’s life in pictures is important, but don’t miss the moment by trying to always have the perfect picture. Step away from the camera and really enjoy the moment. Sometimes the memory is better when you are actually playing in the pool with your child and not photographing it! Don’t keep thinking life will be better when…..my baby sleeps through the night, my child is potty trained, my child is in school all day—with every stage is a new challenge and a new joy. Enjoy each moment and each stage…they are all special. 45. Keep it simple…working at parenting too hard or making it too complicated robs the simple joy! Let’s make this an even 50! What are your tips to share with others? Share your wisdom…and help us all to enjoy every challenge and every joy of being a parent. Like Raising Kids with Love on Facebook and join in the conversation! Take a minimalist approach to toys and clothes. Accumulated stuff and too many choices quickly become overwhelming and rob joy from you and your children. They truly want time with you more than gadgets!